A father eats cheese from his son at a restaurant. 3 Do You Thaw Frozen Cheese Before Grating It? With the United States as the leading global producer of cheese, it's only natural that Americans would be committed cheese lovers. Cheese is a versatile dairy product that's available in numerous varieties, and the opportunities to include it in your diet are myriad. Like many other delicious foods, however, cheese is often high in calories and fat, which is a concern when you are dieting. Take heart, there is good news. You can eat cheese when you're dieting if you limit your portions and don't exceed your target caloric intake each day. Incorporating cheese into your weight-loss plan is easier if you select low-fat or nonfat varieties. A significant portion of the calories in cheese comes from fat. For example, a 1-oz. serving of whole-milk mozzarella has 6.4 g of fat and 85 calories; the same-size serving of nonfat mozzarella has no fat and only 40 calories. If you're a cheese aficionado, you may find nonfat varieties of cheese less than satisfying. In that case, plan your menus carefully so that you can occasionally enjoy small servings of your favorite cheeses. This is good practice for when you reach your goal and need to learn how to enjoy your favorite foods while maintaining your weight. Portion control is important in any weight-loss plan but especially important if you are including cheese in your diet. You can easily overdo it with cheese, because it is calorie-dense, meaning a small portion has a large number of calories. If you are eating sliced cheese, check the nutrition label to determine the calories per slice. For bulk cheese that you cut yourself, a 1-oz. serving is about the size of four dice or roughly the size of your thumb. If you have a kitchen scale, weigh your servings until you get used to what an ounce of cheese looks like. It is a bit easier to manage portion control with shredded cheese, because you can use a measuring cup. A small amount of shredded cheese often makes a low-calorie dish much more flavorful. It's important to enjoy the food you eat while you're dieting so that you can stay motivated. Different types of cheese vary not only in taste and texture, but also in caloric content. In general, soft cheeses have fewer calories per serving than hard cheeses, because the water content is greater. Some of the lowest-calorie soft cheese options include camembert, brie, feta, provolone and mozzarella. Reduced-fat versions are available for all of these cheeses, although you may need to shop around to find them. When eaten in moderation, cheese is a healthful food that can help you maintain adequate intake of important nutrients while dieting. Cheese is an excellent source of protein. 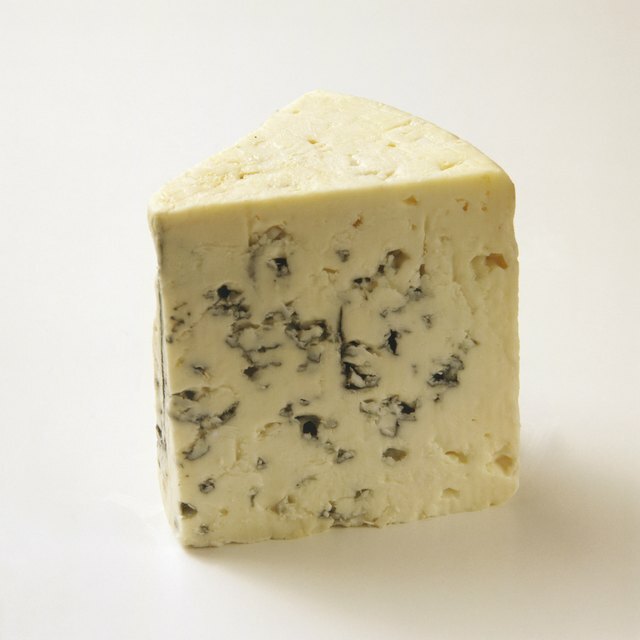 The amount varies among the different varieties of cheese but is typically highest in the hard cheeses. Cheese is also a good source of magnesium, calcium and phosphorus, minerals needed to support your bone health. Other common nutrients in many varieties of cheese include vitamins A and B-12, folate, iron and zinc.